When Amazon unveiled a six-wheeled urban delivery robot called Scout a couple of weeks ago, its website was pretty definitive about who was behind it. But that’s not the whole story. 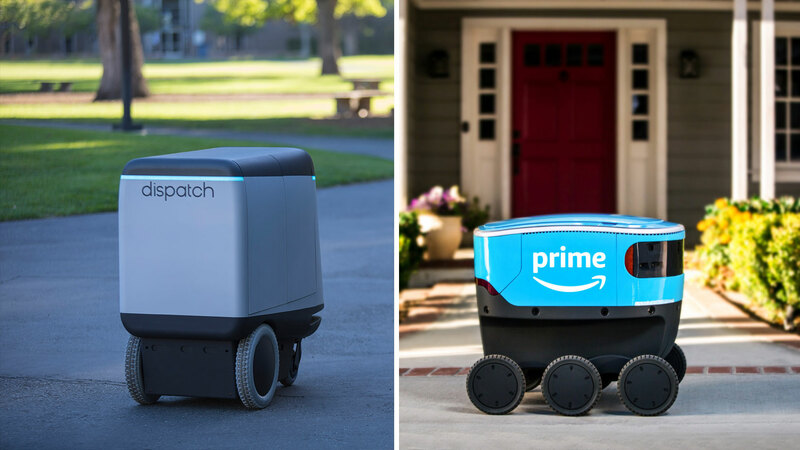 TechCrunch has discovered that Amazon stealthily acquired an urban delivery robot startup called Dispatch in 2017, bringing in both IP and talent from the company to the e-commerce giant. Amazon has confirmed to TechCrunch that it acquired Dispatch. It would not provide further details. The Dispatch.AI website is still active — and press reports have even called its robot a rival to Scout — but the people behind Dispatch have actually been working for Amazon for well over a year. Amazon’s debut of Scout last month drew initial comparisons between it and another delivery robot made by Estonian startup Starship Technologies, and some even wondered if Amazon was working with the startup. Now, that connection appears especially ironic in light of Dispatch and its own origin story. Back in 2014, when Starship Technologies first revealed its prototype urban delivery robot, it caught the attention of three young engineers who were working together at a New York real estate visualization company: Stav Braun, a computer vision expert; Uriah Baalke, an alumnus of legendary robotics lab Willow Garage; and Sonia Jin, a computer scientist from MIT. The trio realized they had all the necessary skills to build a U.S. rival to Starship. In the spring of 2015, they incorporated Dispatch Inc., in the Californian seaside town of Marina. Within six months, they had moved the company to South San Francisco and, with the help of mechatronics engineer Buddy Gardineer, built an electric semi-autonomous robot called Carry that could transport up to 100 pounds. Dispatch launched pilot programs on two college campuses in California — ideal environments to perfect their robot without having to navigate public rules and regulations. With successful tests behind it, the company secured a $2 million seed round in early 2016 from VCs at Andreessen Horowitz and Precursor Ventures. Dispatch grew to around 10 employees, and late that year, filed its first patent application. The company appeared to be on the verge of becoming a major player in robotic delivery. Then in 2017, everything suddenly went quiet. Baalke made his last tweet in June, and the official Dispatch Twitter account fell silent at the start of August 2017. The Menlo College pilot finished, and the university has not had contact with Dispatch since. The Dispatch website is still live, however, and none of the founders have updated their LinkedIn profiles. Public records suggest that Amazon acquired the company around the same time. Dispatch’s sole patent was transferred to Amazon Technologies, Amazon’s R&D subsidiary, on November 22, 2017. Six days later, Braun surrendered Dispatch’s business registration in California. Dispatch’s founders and employees have kept a very low profile since then, although the available evidence points to them having moved with the company. Braun registered to vote in Seattle last fall. Xiaodong Lan, a robotics engineer whose LinkedIn profile says he is still at Dispatch, is mentioned in the resume of his PhD mentor as now working as a research engineer at Amazon. Amazon’s robot has superficial physical differences from Dispatch’s. Scout has six wheels to Carry’s four, and opens at the top instead of the side. But the vision, obstacle avoidance and navigation algorithms it requires for urban and suburban deployments will need to solve the same problems, such as uneven paving, curbs, street furniture, pedestrians and animals. Amazon likely had many more people than just the Dispatch team working on Scout. The LinkedIn profile of one of Amazon’s scientists says the company has been working on relevant robotic perception, planning and localization (mapping) technologies since 2015. But two other profiles suggest that the Scout project only became a serious business, including buy-in from Jeff Bezos, around the time that Dispatch was acquired in 2017. Amazon never announced the acquisition of Dispatch. The company’s big news that year was buying Whole Foods for $13.2 billion. In its latest 10-K filing with the SEC, Amazon noted, “During 2017, we also acquired certain other companies for an aggregate purchase price of $204 million. The primary reason for our other 2017 acquisitions was to acquire technologies and know-how to enable Amazon to serve customers more effectively.” Among these were home automation, e-commerce and AI businesses. Amazon continued its buying spree in 2018, spending nearly $2.2 billion on smart security camera firm Ring, online pharmacy PillPack, and $57 million on “certain other companies.” Whether these turn out to be robotics or transportation startups like Dispatch is something we might only learn when someone notices their founders have suddenly gone quiet, too.